The hull baseplate, front and rear were etched as a single piece. This was done as a double-sided etch so as to provide etched score marks on the internal faces for bending the hull front. The rivet detail was etched onto the outer faces together with location marks for the rear plate detail and the rectangular access hatches in the vertical rear plate. The hull sides were fabricated from cut brass sheet. The whole open top assembly was soldered together with a 25 W soldering iron and multicore solder. The glacis plate and forward deck were etched integrally, this time with no score for bending, as the bend is only shallow. They were etched with locating marks for the MG turrets, the driver’s position, the anti-splash strips and the filler cap on the glacis, plus, of course, rivet detail. The grilles for fitting onto the raised blanks mentioned above were etched separately. The turret deck and engine deck were also etched as one piece with raised blank areas to take the rearmost grilles and the grille immediately at the turret rear as well as to represent access panels on the RH side of the engine deck.. The grilles under the engine deck cowling were etched directly into the engine deck as was rivet detail. Location holes were etched right through the deck for standing air intakes and the exhaust pipes. The track design is especially interesting, as the edge of the inner face is sculpted to accept the sprocket teeth and so the sprockets engage on the inside of the outer edges of the track. This can be seen clearly on the Medium Mark II at Bovington. Each track was fabricated from 3 pieces: outer face, inner face and guides. The inner face had an etched central locating groove to take the track guides. The two faces were staggered so as to provide an overlap for joining the two ends. I used UHU for joining the faces back to back and superglue for locating the track guides. A miniature soldering iron could be used. The track guides are best positioned at the same time as track fitting. Otherwise they may become detached when the track is bent to shape. Road wheels and return rollers were each fabricated from two etched faces superglued back-to-back. Each had a central hole to take an axle. The front idlers and the sprockets each had the same centre spoked wheels, but the sprockets were slightly dished and separate rings of teeth were superglued to the rims of the spoked centres. The two halves of these wheels were separated by a piece of plastic tube to ensure the correct spacing. The road wheels were mounted as four sets of four bogies on each side. Each set of bogies was assembled using etched brass plate bent to give a rectangular section channel. These were drilled to take wire axles. The main box frames were prepared as shown in the mask and made up on a length of rectangular section channel bent from brass sheet. The bogie assemblies were superglued into the undersides of the rectangular channels. Other detail was added as appropriate. The front angled heavy duty wheels and shock absorbers were also added separately as was the rear trailing road wheel. The sprockets, idlers and return rollers were each mounted on wire axles and the box assemblies drilled to take these. Transmission drums were made from scrap found in the scrap box and fitted to the hull rear as required by the drawings. The completed box bogie assemblies were then superglued to the hull sides, taking great car to locate correctly and squarely. Finally, the track was carefully bent to the correct shape, not forgetting to add just a little sag. On the real vehicle there appears to have been only very slight track sag, so this should not be overdone. I used a pair of round nose pliers and repeated tweaking to get the track just right. It is wise to paint the track and wheels before final assembly, as access afterwards would be tricky. Stowage boxes were made from more etched sheet. Mudguards were then added from plain brass sheet. The two machine gun turrets were constructed from etched brass, with the mantlet detail being completed in polystyrene. The machine guns were made from short lengths of steel rod. Similarly the main turret was made from etched sheet, with the conical section and the roof with bustle as two parts. The turret front fittings and armament were made from a combination of etched brass and polystyrene. The bishop’s mitre cupola was made from etched brass. I modelled this in the open position and added a figure from my scrap box. The exhaust assemblies were bent from copper wire with aluminium foil fittings. Each silencer was made in two halves with etched disc ends. Fish tail exhausts were made from polystyrene sheet. The large cover was etched and bent to shape. Note that the RH exhaust goes through the side of this cover, but the LH exhaust does not. The nets of the air intake cowls were etched from sheet, bent into shape and fitted over the locations on the deck. Handles for the various hatches were made from thin copper wire. The driver’s position was constructed as indicated by the sectional drawings and with much consulting of photographs. It is basically a flip up visor that fits down to a hinge out front panel. The whole assembly fits between the two MG turrets. The surrounds for the side escape hatches were bent up from plain brass sheet and inserted into the apertures in the box bogie assemblies. Headlamps were turned from plastic rod held in a small circuit board drill chuck. The faces were drilled out, the interiors silver painted and then lenses punched from clear plastic packaging added. Fire extinguishers were made from brass rod. Hawsers were made from twisted copper wire. Rather than painting these, they were dipped in ferric chloride solution for a couple of minutes and then passed through a spirit burner flame, quenched in water whilst still hot, rinsed and dried. This gives a natural dark rusty coloured finish. Shackles were made from copper wire. The frame aerial around the turret was made from nylon monofilament mounted on spreaders made from staples. These are a convenient source of narrow flat metal strip and nylon is much tougher than stretched sprue. There are numerous other small fittings that are shown on my drawings. I didn’t worry too much about the precise shade of green for the final painting, as I was planning a liberal amount of mud and dust and just a little rust. The base colour was Humbrol bronze green, with an overall wash of dust. To make a dusty finish, I sift wood ash through a 200 mesh sieve, suspend it in water with a trace of detergent and add a drop of office gum as binder. Thicker suspensions can be used for mud. Rust can be simulated by treating exposed brass directly with nearly spent etchant. I also use aqueous suspensions of iron oxides (you can grind your own real rust). Track was painted a base mud colour and highlighted with steel colour on high points and on the track-guides and the edges where the sprockets engage. Transfers were printed with a laser colour printer onto waterslide decal paper. As it is not possible to easily print in white, I printed a colour gradient across the estimated base colour of the vehicle, together with a ruler scale. I then judged the best match within the gradient and set the background colour in my graphics program to this colour. White markings with this background can then be placed onto the model without the background appearing out of place. This was not an easy project. Not only did the drawings for the vehicle have to be researched before a start could be made with building, but I also had to develop manufacturing techniques. The whole project took some considerable time, but the end results were satisfying. I hope eventually I will be able to make further improvements in technique for future projects, but in the meantime hope that passing my experiences on will be useful for others. 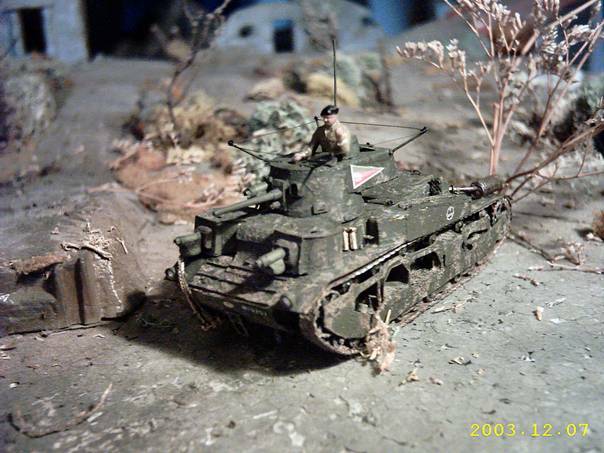 I’m also very pleased to have built one of the lesser known, but none-the-less important, British inter-war vehicles.